Most gardeners are used to having to deal with common garden pests, like aphids, whitefliesor cabbage worms. Treatments for these pests are specifically created not damage the plants that they are intended to save. Sometimes, though, it’s not our gardens that need pest control, it is our homes. Termite infestations in homes can cause signification. Unfortunately, grandma’s special recipe of a little water, mouthwash and dish soap won’t rid a home of termites like it can rid a garden of aphids. Exterminators must be brought in to fumigate infestations. 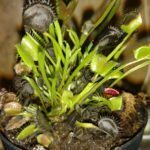 As you prepare for the extermination date, you may wonder “will fumigation kill plants in my landscape?” Continue reading to learn about protecting plants during fumigation. When homes are fumigated for termites, exterminators usually place a large tent or tarp over the home. This tent seals off the home so that insect killing gases can then be pumped into the tented area, killing any termites inside. Of course, they can also damage or kill any houseplants inside, so removing these plants prior to tenting is important. Homes usually remain tented for 2-3 days before it is removed and these light insecticidal gases float off into the air. Air quality tests will be performed inside the home and then you will be cleared to return, as can your plants. While exterminators can be very good at their job of killing things, they are not landscapers or gardeners, so their job is not to ensure your garden grows. When they place the tent over your home, any foundation plantings that you have are not really their concern. While, they usually tuck and secure the bottom of the tent to prevent gases from escaping, vines on the home or low growing foundation plants may find themselves trapped within this tent and exposed to harmful chemicals. In some cases, gases still escape from the termite tents and land on nearby foliage, severely burning it or even killing it. Exterminators often use sulfuryl fluoride for termite fumigation. Sulfuryl fluoride is a light gas that floats and generally does not run off into soil like other pesticides and damage plant roots. It does not run off into wet soil, as water or moisture create an effective barrier against Sulfuryl fluoride. While plant roots are generally safe from this chemical, it can burn and kill any foliage it comes into contact with. To protect plants during fumigation, it is recommended that you cut back any foliage or branches that grow up near the home’s foundation. To be safe, cut back any plants within three feet of the home. This will not only protect foliage from nasty chemical burns, it will also prevent plants from being broken or trampled as the termite tent is placed and make things a little easier for the exterminators. Also, water the soil around your home very deeply and thoroughly. As stated above, this wet soil will provide a protective barrier between the roots and the insecticidal gases. If you are still doubtful and concerned about the well-being of your plants during fumigation, you can dig them all up and place them in pots or a temporary garden bed 10 feet or more away from the house. Once the fumigation tent is removed and you are cleared to return to your home, you can replant your landscape. Read more articles about Pesticides.